Michigan has had more than its share of labor disputes between hospitals and nurses. A high-profile walkout among nurses in Marquette, a public dispute at Huron Valley-Sinai Hospital in Commerce Township, and the formation of unions at two hospitals in 18 months are just part of the story. The conflicts have several causes, and are critical in an industry that's being graded on dollars and cents but also on quality — and one where lives are at stake. Higher pay isn't at the top of the list of what nurses want, although that wish is in their top five. What they most ask hospitals for is a safer workplace, for themselves and their patients, where nursing shifts are limited to 12 hours or less, patients can count on sufficient numbers of nurses per shift and hospitals don't regularly rely on nurses to perform housekeeping or patient transportation duties in addition to patient care. Crain's interviewed nurses at seven hospitals, most of whom are in unions and involved in contract negotiations. Three hospital nursing executives also were interviewed. Scott Balko, an operating room nurse at UP Health System-Marquette, said the No. 1 issue for nurses at the 300-bed hospital is mandatory overtime driven by poor working conditions because of understaffing that he said discourages nurses from applying for jobs and causes unnecessary turnover. "We don't have the number of nurses to do the job. They are working longer shifts and putting patients in unsafe conditions," Balko said. "There are no regulations on hours for nurses like there are for truck drivers." Stephanie DePetro, an emergency room nurse also at UP Health, the former Marquette General Hospital, said nurses want specific nurse-patient ratios for each department. "There are work standards for many professions, but there is no law for how many patients we are asked to care for," she said. Last month, 400 nurses went on a two-day strike in Marquette to protest working conditions and lack of solutions from management over a union contract under negotiation for five months. UP Health is a for-profit hospital purchased in 2012 by Nashville-based Duke LifePoint. Tom Casperson, R-Escanaba, said he believes nurses when they tell him how they are often left no choice but to work overtime when hospitals fail to properly staff shifts. He said hospitals tell him the nursing shortage prevents them from hiring more nurses, a contention nurses dispute. The U.S. Bureau of Labor Statistics reports more than 100,000 registered nurse jobs will be available annually until 2022. Judy Moore and Kathleen Lehman are nurses at DMC Huron Valley-Sinai Hospital in Commerce Township. But nurses such as Judy Moore, an intensive-care and step-down unit nurse also at DMC Huron Valley-Sinai Hospital in Commerce Charter Township, question whether nurse staffing problems are caused by a nursing shortage or simply because nurses don't want to work at hospitals when they have few rights. A growing number of nurses have retired, changed occupations or become administrators in recent years, experts say. "(Hospitals) tell us they can't hire more staff because of a nursing shortage," Moore said. "There is not a nursing shortage. There are plenty going into colleges now. (Hospitals) are just not hiring." In March 2016, Huron Valley Sinai nurses voted in a union that is affiliated with the Michigan Nurses Association. But after 16 months of negotiations, the nurses are still without a contract. Earlier this month, the Huron Valley nurses union released a scathing 38-page report that documented 240 incidents of poor patient care they say were directly related to insufficient numbers of nurses per unit. They asked for an investigation by the state Department of Licensing and Regulatory Affairs. They also filed a lawsuit in Oakland County Circuit Court over alleged public health code violations. Moore said DMC has frozen nurse hiring, which has resulted in fewer floor nurses because turnover continues at high rates. Shawn Levitt, DMC's chief nursing officer, declined to address difficult contract issues. "We don't negotiate contracts in the media," she said. Lori Stallings, Huron Valley chief nursing officer, said hospital management is making good progress in the talks, but wasn't sure when a contract might be signed. Casperson, who joined to support hundreds of nurses from all over Michigan in Marquette for the strike, is one of six legislators who are co-sponsoring the Safe Patient Care Act that is part of a three-bill, bi-partisan package. "I am supporting the nurses because when nurses work to exhaustion, it is a patient safety issue," Casperson said. A nursing strike is an extreme event that doesn't happen often in Michigan. But nurses say it illustrates the growing rift between nurses and management over key issues that involve patient and nurse safety, staffing, pay and respect. Two top hospital executives told Crain's they believed staffing and patient care issues are exaggerated by nurses and what they really want is higher pay. But nurses pushed back and said that may have been true in the past, but now the primary issue is too few nurses per shift and mandatory overtime that pushes many nurses to work 16-hour days. Crain's research has found six strikes since 1979 at hospitals in Michigan, a 1994 strike at Marquette General, the one this year and two at the University of Michigan Hospital in the 1980s. The longest strike and dispute went on for nearly three years starting in November 2002 at the former Northern Michigan Hospital in Petoskey, now McLaren Northern Michigan. In 1979, nurses at St. Francis Hospital in Escanaba struck for 120 days before it was settled with help from a federal mediator. Nurses nearly struck four times since 2000 at Genesys Regional Medical Center in Grand Blanc Township before settling on contracts. 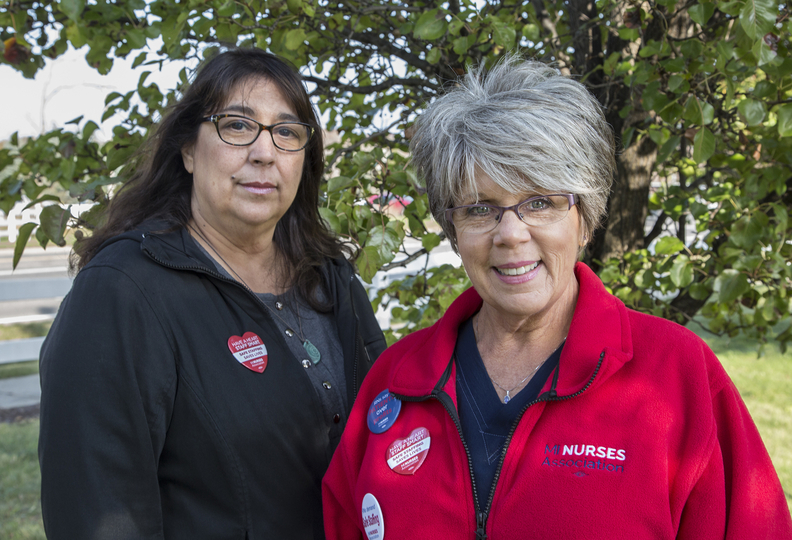 In the past 18 months, nurses have formed unions at Huron Valley-Sinai and Munson Medical Center in Traverse City. Nurses interviewed by Crain's said they believe more hospitals in Michigan are voting for unions or considering ones to help argue their case for better patient care to management. Nursing councils or committees are not strong enough voices, they say. Hospitals have waged intense bidding wars to fill nursing vacancies. They have offered nurses huge signing bonuses and even sport-utility vehicles and vacations to the Bahamas. However, those efforts often only served to exacerbate turnover, spurring nurses to remain in jobs just long enough to claim the prizes before moving to other hospitals with better incentives, several nurses told Crain's. At the same time, hospitals also have engaged in various methods to hold down nursing salaries. In settlements from 2009 to 2015, eight health systems in metro Detroit paid about $90 million to settle a class action lawsuit over nurse wages that spanned 2002 to 2006 and involved more than 20,000 nurses, Crain's reported in a story in September 2015. Some systems that settled included Detroit Medical Center, Beaumont Health, Henry Ford Health System, Trinity Health and St. John Providence Health System. On the flip side, many hospitals have taken steps to improve relations with nurses. Some have been certified as "magnet" hospitals from the American Nurses Association and the Institute for Healthcare Improvement. So far, more than 300 hospitals nationwide, including Beaumont Health, the University of Michigan and 12 other hospitals in Michigan, have been credentialed as magnet hospitals. A 2013 study by the University of Pennsylvania found that magnet hospitals have 14% lower mortality risk and 12% lower failure to rescue rates. Magnet hospitals are more likely to offer more flexible hours, lower caseloads and pay for advanced training and give nurses more authority. Nurses tell Crain's they want to be fairly paid, but they really want better working conditions that would allow them to offer better patient care, said John Armelagos, president of the MNA and nurse for 30 years at the University of Michigan Hospitals. Armelagos said nurses are at the front lines in patient care and act as advocates for patients and their families. "We need to ensure there are enough nurses to take care of patients on every unit and every shift so we can respond and monitor our patients," said Armelagos, who works in inpatient psychiatric adult and adolescent units. "When there are not enough nurses to take care of patients, peer review research shows that patients suffer, outcomes are more negative and mortality increases per patient." In the 1980s, Armelagos said UM nurses twice struck for safer staffing and higher wages. Since then, nurses and management have worked much more closely together to resolve differences, he said. Marge Calarco, chief nursing officer at the University of Michigan, said UM and its nurses agree that safe staffing enables nurses to care for patients in a cost-effective way that produces the best outcomes. But she said nurses also want to be treated with respect by management and valued for the service they provide to society. "Gallup (polls have shown consistently that) nursing is the most trusted by the population," said Calarco, who has been a nurse more than 30 years, the last 15 years as UM's chief nurse. "Every year except for 9-11 when firefighters were recognized, we are the most trusted profession. We are closest to families and patients, 24 hours, seven days per week. We provide exquisite care and are the heart of health care in many ways." Calarco said more than 15 years of research shows that hospitals that have adequate nurse staffing have lower mortality and morbidity. UM works closely with its nursing union to ensure each department has sufficient number of nurses for each shift, she said. "Nurses want to practice in an environment where they are required to take care of sicker and sicker populations," Calarco said. "Populations in hospitals today, 30 years ago would not have survived. Acuity is growing, and expertise is critical. If you don't have safe staffing, you can't do it." But Calarco said she is not a proponent of mandated nurse-patient ratios because they don't allow hospitals sufficient flexibility to take into account patient acuity levels that vary from day to day. "We at UM take staffing very seriously and do it very well," said Calarco, adding that "there are many places in Michigan and across the county that do not to have the resources for safe staffing." Calarco acknowledged that some hospitals look first to reduce costs by cutting nursing staff, which is the largest workforce at hospitals. She said she understands these hospitals set the stage for nurse unions to form and for calls for mandated nurse-patient ratios. "Some hospitals, faced with economic challenges, cut nurse staffing," Calarco said. "We know, the data is clear, that once nurse staffing is cut to unsafe levels, you see decreases in patient outcomes and increases in mortality. I have always seen it is shortsighted, and I have advocated for strong staffing here." Echoing what floor nurses tell Crain's, Calarco said hospitals actually lower costs when they have safe staffing. "Hospitals don't always understand that. (When hospitals have fewer nurses) they have more overtime, need more premium labor, more agency nurses, just to get the work done," she said, adding that quality also diminishes when regular nurses aren't available. "It is a short-term fix that isn't good for the long run." Cindy Rydahl, a surgical services nurse at Munson Medical Center in Traverse City, said nurses need a larger voice in decisions hospitals make on staffing and patient care. "We want safe staffing because the acuity of our patients is sicker than they used to be," Rydahl said. "Our nurse patient ratios need to be improved. We are seeing more emergency patients and they need more care. Acuity is the biggest problem." In August, Munson nurses approved a union for its 1,200 nurses through the Michigan Nurses Association. Negotiations are expected to start soon on a contract. "We want a voice. We want to be listened to and heard," said Rydahl, who has been a nurse for 33 years. "We are at the bedside and know what patients need because we care for them and listen to the families." She said the hospital and nurses have a shared governance committee, but nurses decided to form a union because the committee has been ineffective in resolving issues. Loraine Frank-Lightfoot, Munson's vice president of patient care services and chief nursing officer, said Munson has been taking steps the past 16 months since she has been at the hospital to address staffing ratios in various departments. "I agree that the old shared governance structure was not as effective as could have been. When I went to meetings, there were not a lot of front-line nurses there," said Frank-Lightfoot, who has been a nurse for 32 years. "I am very participatory, and we now have 150 front-line staff involved with committees." Frank-Lightfoot said she understands how difficult it is for nurses to work with insufficient staffing. She said many nurses have been hired in the past year and the vacancy rate has been cut to 3.3%, far below than the national average of 8.8%, she said. "There have been key areas that have been harder for us to recruit — OR, ER and critical care," she said. "We lost a lot of (nurses who worked) in the OR, and it is a steep learning curve" for new nurses. But Frank-Lightfoot said she believes the major issue at Munson for the nurses is pay. "Mandatory overtime and safe staffing are not the real issues," she said. "I believe the issues are around compensation. That is the key." Frank-Lightfoot acknowledged that Munson fell behind market wages for nurses in the past. "We have put $18 million in staff wages, and we are catching up," she said. Kathy Lehman, an emergency nurse at DMC Huron Valley-Sinai, said a reduction in nurses and support staff has been plaguing the for-profit hospital and many others across Michigan. "We have seen a reduction in staff in ancillary care, patient care technicians, sitters, environmental services and patient transporters," said Lehman, a nurse for 17 years, the last 11 at Huron Valley. Moore said hospital consolidation and for-profit ownership has led to bigger lobbies but fewer caregivers at the bedside. A nonprofit hospital until 2011, Huron Valley-Sinai is part of DMC, which is owned by for-profit Tenet Healthcare Corp. of Dallas. Levitt said Huron Valley staffs nurses and others based on daily patient counts and industry standards. Stallings cited "A" grades since 2012 that Huron Valley has received from the Leapfrog Group for patient safety. Moore said Huron Valley nurses "have lost our voice at the hospital, as far as what we feel is best for the patient." But Levitt said Huron Valley is also a magnet hospital certified by the American Nurses Association that has a shared governance model where nursing practice issues are brought forward and worked out. Lehman confirmed that Huron Valley has a professional nurse council, but suggestions have been put on hold. "We are a magnet hospital and should be sitting in on decision-making, but it isn't happening," she said. Moore said nurses have committees for pharmacy, finances and quality. "But they have taken nurses' voices away from hospitals and are making decisions based on profit," she said, adding: "Patients were never at risk when we were nonprofit. Decisions aren't local anymore. They are always made at the corporate level." On the other hand, nurses like Moore and others interviewed by Crain's insisted they would do their job and go beyond normal staffing to take care of patients. "I am here at Huron Valley because I love taking care of the community. No matter what is going on, the nurses work really hard so patients are not compromised," Moore said. Tom Hall, a multi-department float nurse at McLaren Lapeer Hospital, said the MNA-sponsored union has been negotiating a new contract with the hospital since May. The Lapeer nurses signed their first union contract in the mid-1990s and have a range of issues to iron out with the McLaren hospital, including sufficient number of employed nurses. Hall said Lapeer nurses want lower staffing ratios, which have been increasing the past five years as the Affordable Care Act has cut Medicare reimbursement rates. "How would you feel to be the sixth, seventh or eighth patient for a nurse working 16 hours?" said Hall. Sheila Kahn-Monroe, vice president of labor relations with McLaren, said the 12-hospital system allows local hospitals to set nurse staffing policies, although corporate policy is focused on ensuring safe staffing and that the nursing workforce has the right skill mix. Kahn-Monroe said the McLaren Lapeer contract talks are fairly typical and she expects a signed deal by the end of the year. "We are using a collaborative, interest-based approach and working through discussions," she said. "Nurses want lower nurse-staff ratios." Kahn-Monroe said 10 of McLaren's 12 hospitals have nursing unions. Three are engaged in contract talks, including Lapeer, Bay and Macomb hospitals, she said. "Each facility looks at census and whether they need to move resources" into clinical departments based on volume and acuity changes, Kahn-Monroe said. When volume or acuity levels rise, hospitals bring in additional nurses to maintain good patient care, she said. However, Kahn-Monroe said hospitals review patient activity every four hours and if volume dips, nurses could be sent home. "We balance that to make sure they get the hours they need," she said. One of the biggest problems nurses some hospitals have faced under Obamacare is how executives react when their hospital Medicare quality scores dip and they don't qualify for higher federal reimbursements under value-based payment formulas. "If the hospital doesn't get all 9s or 10s, we don't qualify for reimbursement, and the nurses are belittled and given more work to get the scores up," Hall said. "It sometimes adds two to three hours of different work every day just to get the reimbursement. We don't get extra help." Hall said one bad patient experience can lower Medicare patient satisfaction scores. "If they provided enough nurses to do the extra work, we could more easily get the scores," he said. "If you are that eighth patient you will write the bad score. If we had enough nurses where you are the fourth patient, we have more time to do a good point." Kahn-Monroe said she does not believe that McLaren Lapeer blamed nurses for lower than expected patient satisfaction scores. "Lapeer does need some work, but it isn't just nurses. I take exception that nurses are being singled out," said Kahn-Monroe, adding that when patient satisfaction scores dip the entire patient care team is asked to improve. "We go back to staff and ask how we can improve," she said. Rydahl said Munson nurses often agree to overtime because paperwork requires an extra 30 minutes to an hour to complete after a 12-hour shift. "We have too many patients who needed nursing care," she said. "I would be abandoning my patients if I left. It is a scheduling problem as well as higher acuity." Munson often schedules too few nurses in hospital departments, said Rydahl, and that often requires nurses to do many non-nursing duties. 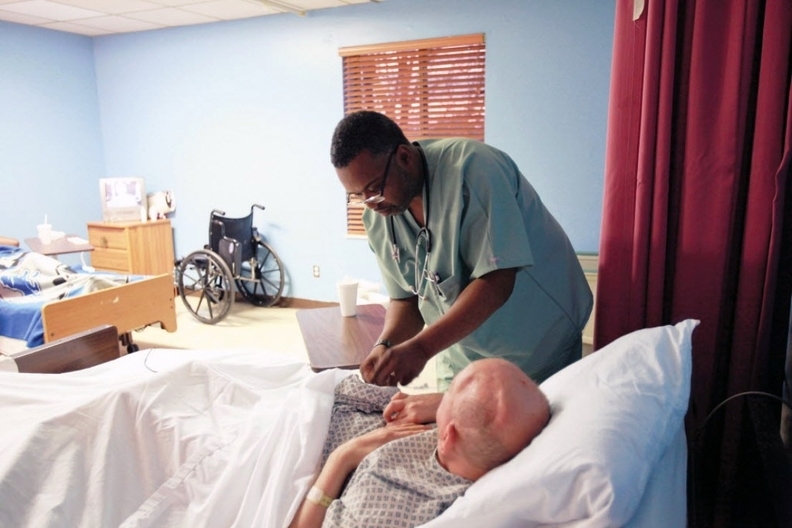 They include patient transportation, housekeeping and patient sitting, she said. Moore said DMC Huron Valley-Sinai also has cut staff in patient transportation, environmental services and housekeeping. "We are leaving the floor to transport patients, to take out the garbage and sweep the floors," Moore said. "Patients are asking where the help is. We want to care for patients, and we are not getting support." Armelagos said UM nurses addressed the issue on non-nursing duties years ago in their contracts. "Hospitals are foolish when they have nurses doing non-nursing tasks," he said. "The work is comprehensive enough not doing the work as a clerk. But when something needs to be done in the hospital and there is nobody else do it, nurses do it. Hospitals know this and cut support staff on purpose." Lehman said nurses have several complaints about how Huron Valley-Sinai schedules nurses. When patient volume drops during the day, the hospital sends nurses home. "It is called 'K' time. You go home without pay or you can use vacation hours," said Lehman, adding that except for the operating room and cardiac catheter laboratory there is no on-call schedule. "We work three 12-hour days, and sometimes much longer," Lehman said. "What every nurse wants is some kind of a floor. We want to know how many nurses are on call during a day and keep to a safe staff ratio. You have to take into consideration emergencies because we need to be able to see patients safely." For example, Lehman said often in the emergency department nurses face short-staffing when trauma cases mount up, increasing typical 4-1 patient to nurse ratio up to 7-1 or more. While Hall said mandatory overtime is limited in the Lapeer nurses' current contract, the hospital does not always abide by staffing guidelines for every department. "We do have some nurses who will stay voluntarily. It is not considered mandated hours because a nurse has volunteered," Hall said. "If no one will stay, that is when they go to mandatory." The last two years, however, McLaren Lapeer has been unable to hire enough nurses, Hall said. "They like to say it is because of the nursing shortage. But we have several schools that produce 40 to 60 nurses per semester," said Hall, noting that there are three hospitals in Flint that also hire nurses. "We deal with issues of competitive pay. If you pay lower wages than other hospitals, you won't get as many nurses." Hall said he knows several nurses at Lapeer who have graduated from nursing school and decided to go into home health or health insurance because of pay and working conditions at hospitals. Kahn-Monroe said McLaren Lapeer recently hired a number of nurses to fill vacancies. "We had some turnover there, but we were able to hire people in," she said. Calarco said nursing shortages are cyclical and often based on geography, with rural hospitals sometimes having more trouble attracting nurses than suburban hospitals because of pay and other factors. But Calarco said hospital vacancies are sometimes created when there is low nursing staff and nurses become overworked and dissatisfied. She said there is no shortage of nurses in Ann Arbor, partially because nurses want to work at UM. "You have a downward spiral when you create more vacancies to fill," she said. "Nurse recruiting and retention is impacted by practice environment of hospitals." "What do nurses want?" originally appeared in Crain's Detroit Business.